Member of American Watchmakers-Clockmakers Institute and the National Association of Watch & Clock Collectors since 1986.
to man's first step on the moon. When it was first released in 1957 it really was "the watch of the future," but unfortunately for Hamilton the future passed them by faster than anyone could have imagined. By 1969, when production ended, advanced technology had rendered the Hamilton Electric obsolete. 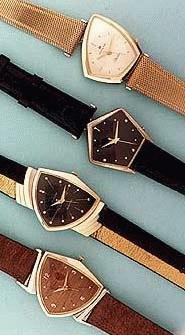 Today these watches are avidly sought by collectors, who appreciate the unique character of this pioneering invention. It is the grandfather of all battery-powered watches produced today, an important milestone in the history of watchmaking. The complete story of the Hamilton Electric can be found in my book "The Watch of the Future". Click here for more information.